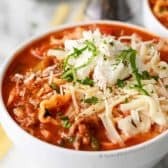 CrockPot Lasagna Soup is the perfect weeknight dinner! In this easy recipe, the slow cooker does all of the work to bring the goodness of lasagna and the comfort of soup together into one amazing meal. Topped with 3 cheeses and fresh herbs, this meal is like a hug in a bowl! Cook beef, onion, and garlic over medium-high heat until no pink remains; drain. Place in slow cooker. Add all remaining soup ingredients except pasta & spinach. Cover and cook on low 7-8 hours or high 3-4 hours. Cook pasta al dente according to package directions. Stir in cooked pasta and spinach. Cover and cook an additional 10-15 minutes. Spoon into bowls and top as desired.